An aerial view of Naples, the Long Beach neighborhood with the most amount of high-end real estate transactions. Courtesy of MLS. Naples and the Peninsula rule the day when it comes to pricey real estate transactions in the world of luxury homes—and for good reason. Two of the most private and removed neighborhoods in the city, these two areas accounted for every single one of the top 10 most expensive home buys in the city, with Naples accounting for eight of them. And while these top 10 sales are high in terms of dollar signs—numbers that a decade ago would have been scoffed at—the overall market is facing shaky ground due to a growing housing crisis (i.e. lack of supply) and a desire for exclusivity amongst buyers. “While the number of homes selling are down significantly, prices continue to increase due to lower inventory and still high demand from buyers,” said Jeff Anderson of Anderson Real Estate, whose agency owned the priciest sale in Park Estates, offing the mid-mod property at 5341 E. El Prado Ave. for $2.3 million. The exterior of 2018’s most expensive home sold in Long Beach. Courtesy of Kim Schumacher. The 4,800 square feet home is located on the sole gated stretch of Naples, within the community of Treasure Island, and boasts a lily pond imported from France, a fireplace that comes from Malta, and Italian marble mosaics. You can park one of your nine cars comfortably before choosing which of four bedrooms you would like to sleep in. The interior of 5548 E. The Toledo. Courtesy of Al Ricci. 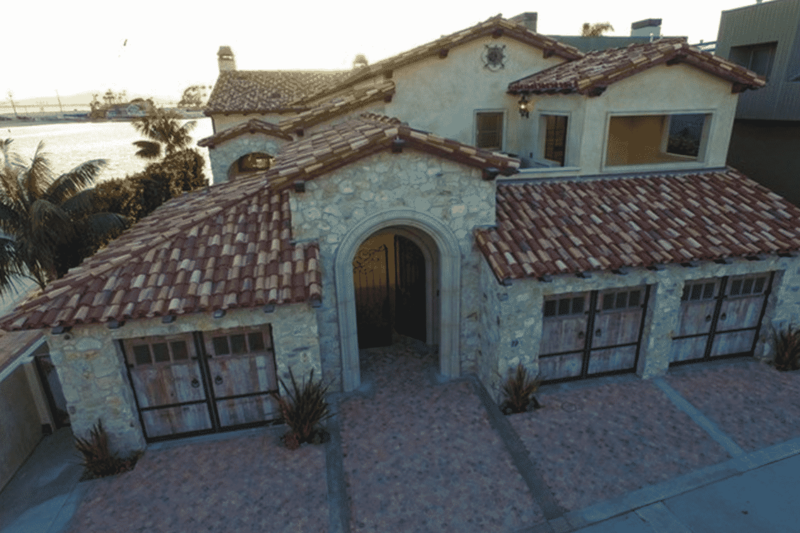 Built in 2001 on a lot that was sold in 1999 for $490,000, this pseudo-Italian-Mediterranean home was initially listed by Orange County broker Al Ricci for $6.9 million before the buyer was able to talk the price down to $5.5 million. 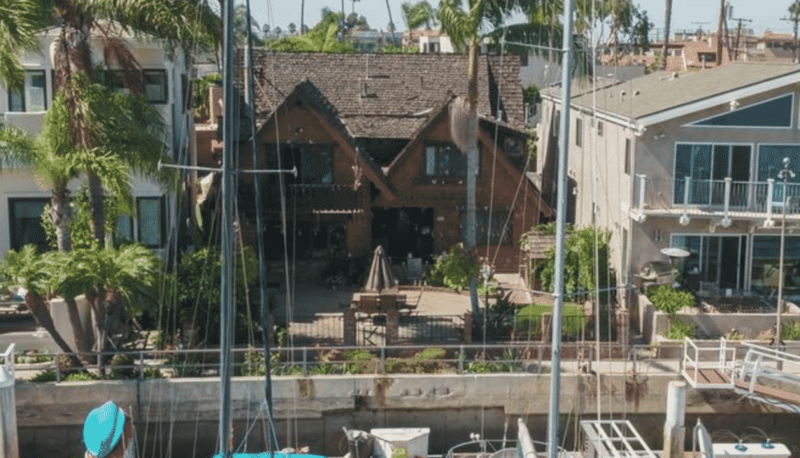 Like many homes in Naples, it boasts its own boat dock along with being located at one of the corners of a canal’s edge, providing unobstructed views of Alamitos Bay. And if you’re not feeling like walking up its granite staircase to access its four bedrooms, you can use the elevator. The waterfront-facing facade of 5705 E. Corso Di Napoli. Courtesy of David Komula. 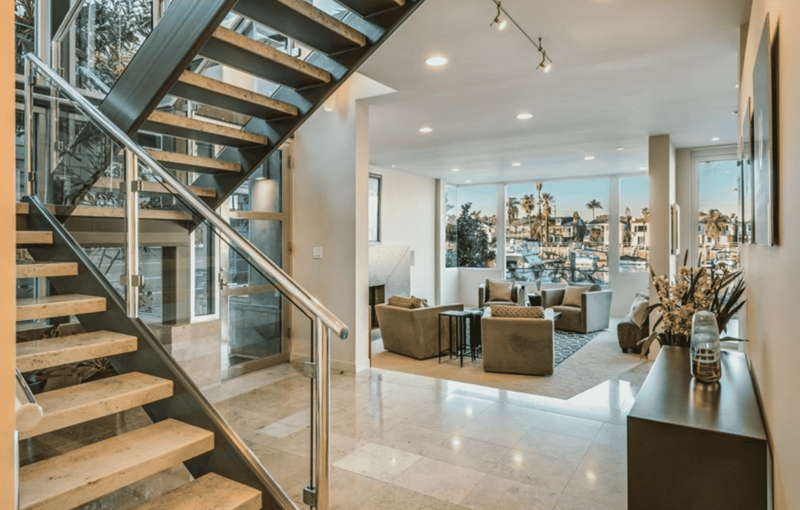 Built in 1991 out of stone and glass and last sold in 2006, this is one of the few homes in Naples which eschews the Mediterranean style and goes for an attempt at a Late Modern aesthetic: With floor-to-ceiling windows and clean lines, the home offers a 280-degree view of Alamitos Bay—making it an easy sale for Los Angeles-based broker David Komula. The interior of 5679 E. Corso Di Napoli. Courtesy of John Huang. 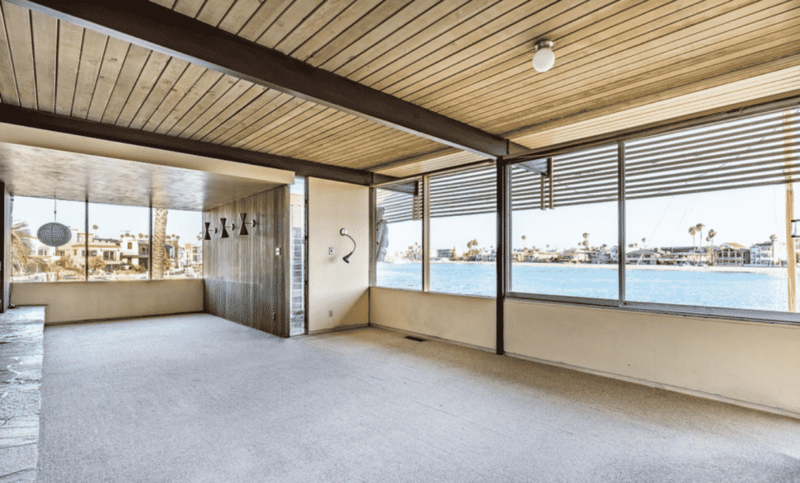 This mid-mod masterpiece was built in 1947 and remodeled in 1956 by renowned Los Angeles architect Ray Kappe—making it easy for Long Beach agent Christopher Livingston to convince his buyer to pick it up for $4.3 million. The beach-facing facade of 6519 E. Seaside Walk. Courtesy of Spencer Snyder. 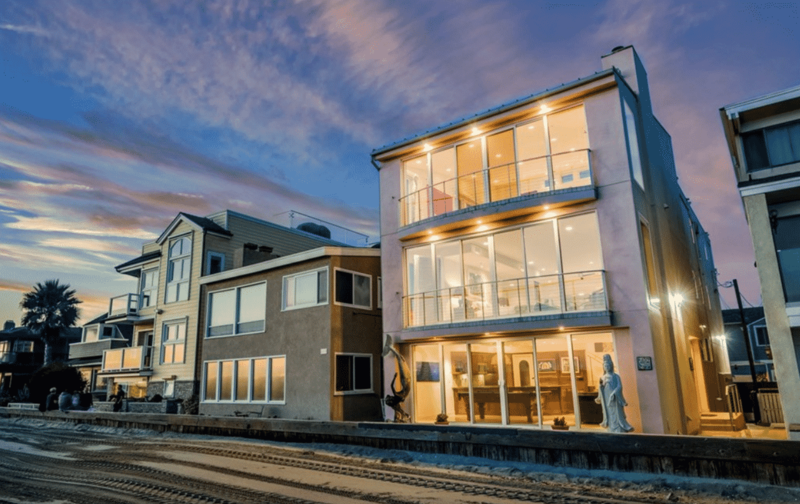 This two-bedroom, six-bath—convenient for the small-bladdered—home on the south-facing beach of The Peninsula was the neighborhood’s most expensive sale and was headed by Long Beach real estate agent Spencer Snyder. Built in 2006, the home had been listed since May of 2017 at a cost of $4.45 million before finally being sold in June of 2018 for $3.75 million. 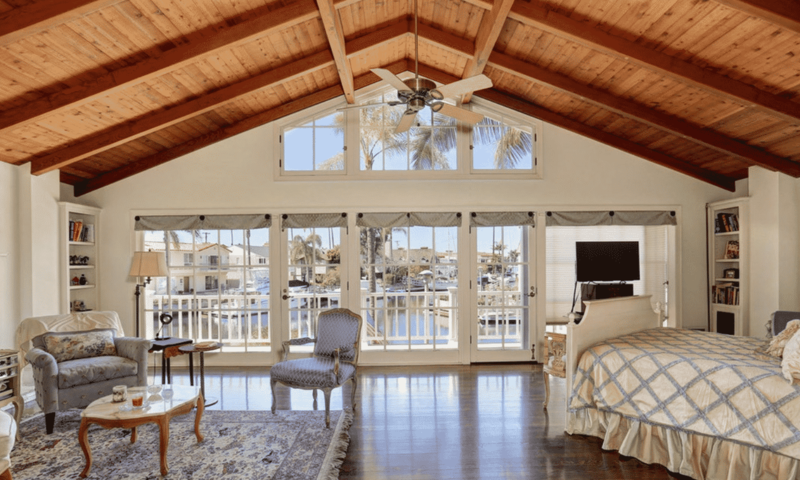 With unobstructed views of the Pacific and Catalina Island, the master “bedroom” is the entirety of the second floor with an additional suite above it. And a plus for oenophiles: It has a 1,600-bottle, temperature-controlled wine cellar made with wood from Napa wine barrels. The interior of 5515 E. Sorrento Dr. Courtesy of Sean Stanfield. 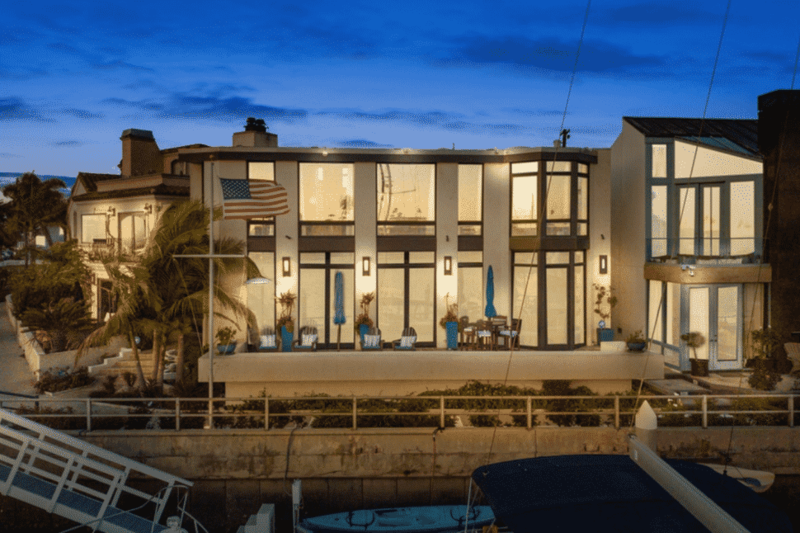 Rebuilt in 2006 by its original owners (who purchased the original structure in 1997 for $630,000), it was first sold in 2016 for $3.125 million and then sold again in 2018 for $3.7 million by Orange County real estate agent Sean Stanfield. 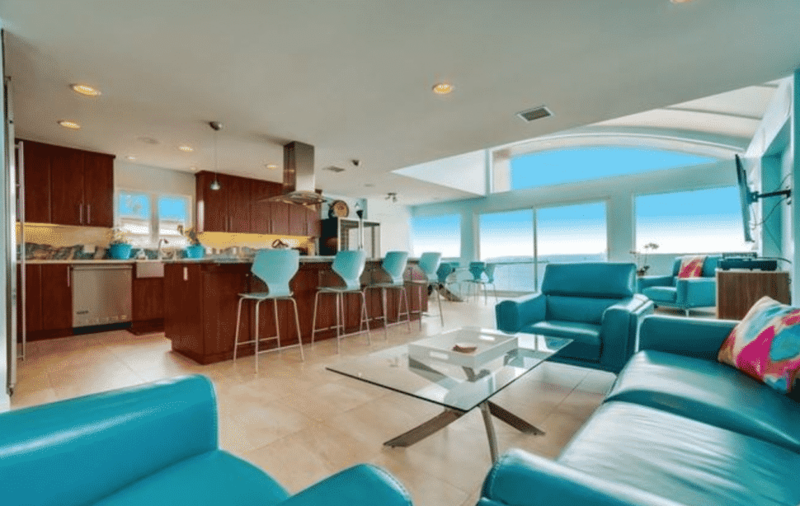 The geometric, contemporary home has patio spaces that feature floor-to-ceiling folding glass doors as well as access to the very small stretch of sand that sits along Naples’ northern edge. The interior of the third floor of 6815 E. Seaside Walk. Courtesy of Kristen DeLuca. Sitting at the eastern-most edge of the south side of the Peninsula, this three-story, beach-facing postmodern home was built in 2007 after the owners—who bought the original structure 2002 for $1.475 million—decided to demolish the existing property. Initially leased for a few years as a rental, it resold in 2014 for $2.875 million and then most recently by Torrance-based agent Kristen DeLuca. Like its other sister Peninsula property making this list, the entirety of the second floor is dedicated to the master suite. For office geeks, the fourth floor acts as both a rooftop patio and an office space. The exterior of 30 Savona Walk. Courtesy of Sotheby’s. Built in 1984 and renovated in 1988, this Mediterranean-inspired villa has been on the market since 2015 for $3.875 million before finally being sold by Sotheby’s International for $3.3 million in June of 2018. This double-lot estate is one of the largest homes on the list—4,185 square feet—and boasts four bedrooms, three baths, as well as a private sundeck and gym. The canal-facing facade of 85 Vista Del Golfo. Courtesy of CRMLS. Built in 1945, this is sadly one of the poorer examples of a Storybook-style home. A very Los Angeles-specific form of architecture, Storybook homes sprang largely from Hollywood’s romanticization of medieval and Renaissance times. The style was popular from the 1920s through the 40s, where the latter end’s aesthetic—like this home in Naples—resembled more commonplace housing than its predecessors—like the spectacular Spadena House in Beverly Hills, renovated in 2006 to reflect the imagination of the style. The third floor of 2 Rivo Alto Canal. Courtesy of Exclusive Realty Inc.
Our final home was built in 1962 and mimics the New England-style cottage beach houses that dotted the east coast’s most revered coastal properties. Last sold shortly before the recession in 2008 for $3.8 million, its most recent buyer was able to talk down the price point. With 60 feet of water frontage, a boat dock, five bedrooms, and three baths, this home boasts a 180-degree view of the canal along with a wrap-around, second-floor deck that once again harkens to its New England-inspired style.